Am I Really A “Helicopter Parent”? The Helicopter Parent… Could You Be One Too??? I had never even heard the term “Helicopter Parent” before until my daughter in grade 12 at the time accused me of being one after I came home to pick up and deliver my son’s school project to him that he had forgotten. Slightly embarrassed, I had to ask her what it was to which she smugly said, “Mom, a Helicopter Parent is a parent who takes care of everything for their child! They hover over their children like helicopters making sure everything is always just fine. 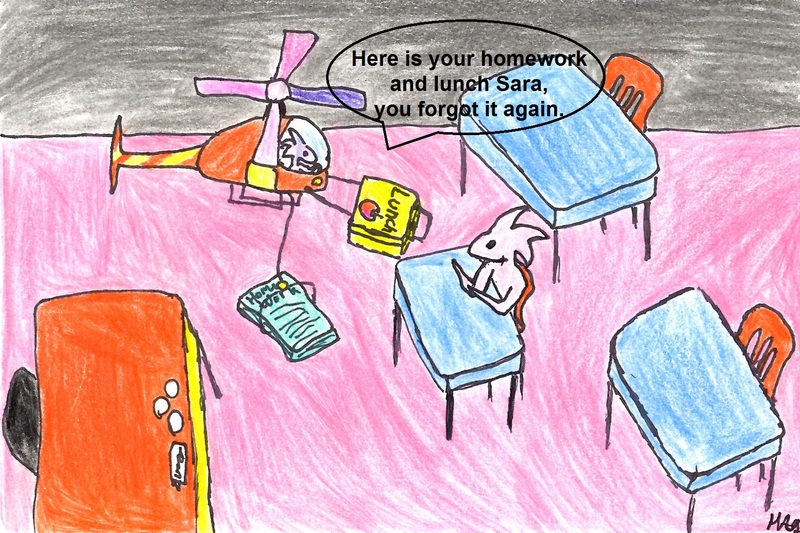 How is James ever going to learn to remember to take his homework if you keep bringing it to him?” She had a good point. When I read up on it a bit more I didn’t think I had all the traits of a Helicopter Parent but there were a few. Sure maybe I requested certain teachers each year for my children or I helped them sometimes a little too much with their homework when they asked or maybe brought their forgotten lunch and homework down to them once in a while, …ok, all the time. Was I really being a Helicopter Parent? I didn’t do Everything for them; I wasn’t following them around hovering and watching over their every move so they never got hurt or experienced disappointment? I didn’t control everything in their life only a few things. I started to think about it. Maybe I was a bit of a Helicopter Parent. After all how was I really helping my child to learn for themselves if I was doing all these things for them? How was I empowering them to make their own wise decisions in life or to learn from their mistakes? Maybe if I stopped delivering my son’s homework to him he would smarten up and pack it the night before. If he didn’t get my idea of a perfect teacher maybe he would get the experience he needed with a different teacher. In reading more about it I read about College professors complaining about parents coming in to tell them they are giving too much homework to their child and their child was overwhelmed. There were managers telling stories about parents coming in to ask for raises for their children, complaining their child was being worked too hard or treated unfairly and they wanted the manager to make changes to improve their child’s work experience. I know being a parent we all just want the best for our children in life and if we could, we would fix everything for them but when is enough, enough! Sometimes it is tough to know the difference between guiding our child and taking over for them. When we take over we send the message to our child that we don’t think they can do it themselves. Not only do they not learn how to make decisions for themselves but they lose their self confidence and coping skills relying on us or others to fix things for them. If a parent fixes everything the child may never learn how to deal with their own mistakes or disappointments in life. I realized as hard as it was to watch my babies make mistakes sometimes I had to let them fall on their own so they would know how to pick themselves up again and keep going when I wasn’t around. By rescuing them all the time I was not letting them experience their life lessons so they would keep repeating their mistakes knowing Mom would take care of it instead of getting the lesson and moving on. The next time James called me from the school to bring down his homework I told him he would just have to run home at recess and get it as I was out. He never forgot it again. It wasn’t as much fun going back for it himself as it was to inconvenience mom to bring it down to him. I learned something very important through my daughter’s simple comment. We can guide and teach our children the best we can but ultimately they will have to figure things out for themselves. If we keep preventing situations from happening in their life they will never learn their life lessons and will always be fearful of taking risks and failing in life. I wanted to empower my children and teach them to have enough confidence in themselves to take risks. To do so I had to take a step back and watch, sometimes guide but ultimately let them experience the natural consequences of their behaviour and do it themselves while they were at home so when they grew up and left they would have the knowledge to take on lifes challenges on their own! For more information on Helicopter Parenting check out this recently published article “How to avoid being a Helicopter Parent” by Jennifer Chung in the Toronto Star.